Further proof that even the most high-profile mums go to pieces when their kids are doing it tough. Kim Kardashian popped up on Twitter during the screening of the latest episode of Keeping Up With The Kardashians to chat to fans, and she revealed a little about a scary experience she had with her middle child Saint. Kim and Kanye West are parents to five-year-old North, three-year-old Saint, 14-month-old Chicago and are expecting their fourth child – a baby boy – via gestational carrier next month. When fans observed Kim going through some big family stuff – i.e. Kanye announcing to fans that he was moving to Chicago without fully discussing it with Kim – they commended her on staying calm under fire. “Kim is so calm. Can she teach me how to be that calm?” one fan posted. The KUWTK star and mum-of-nearly-four agreed that being calm was a sort of superpower for her but noted that when her kids are involved it’s a whole other story. “It doesn’t benefit you to not be calm. But let me tell you when one of my kids gets injured or anything … I’m screaming and freaking everyone out,” Kim tweeted. “I did it this weekend when my Sainty had an allergic reaction,” she explained in a now deleted tweet. “I jumped over the table like a hurdle lol. Screamed call 911 and Khloe had to calm me down! I’m either super-zen or so dramatic,” Kim tweeted. It seems Kim’s not the only one who freaks the heck out when one of their children is in harm’s way. “A mother becomes a lioness when she needs to protect her children. you are absolutely right in losing your temper when they are the subject,” another follower tweeted. 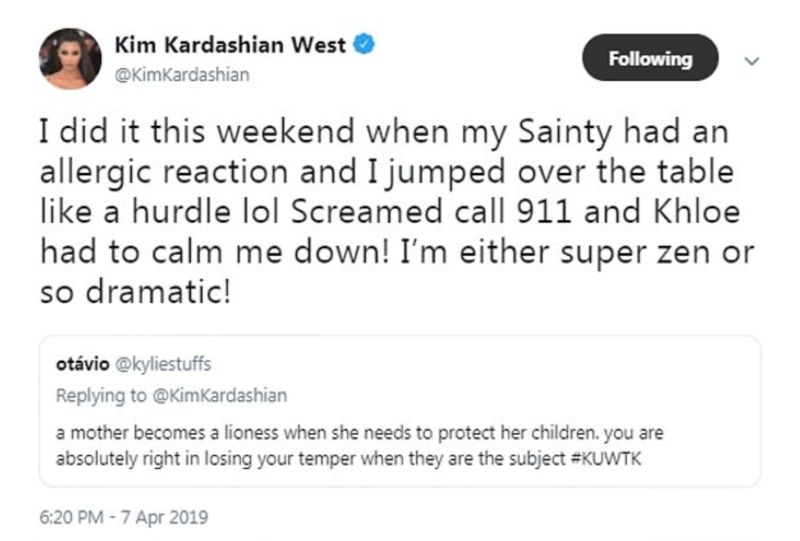 A later tweet from Kim confirmed that, “Yes my baby is fine” and that Saint was now on the mend but she didn’t disclose further details and as we said she has now removed the initial tweet revealing that her toddler had an allergic reaction … perhaps to protect his privacy?